My train is running roughly an hour late, so I won't be able to get breakfast on board; however, that meant I did have time to walk to the Wigwam Restaurant and have breakfast there. (And also win it back on a free-play slot coupon.) On the way home, I was taken by how clear the weather was today. Watch for the rabbit to the right of the pile of railroad material in the center of the video at the start. The bunny lopes away behind the pile as I start to pan. It was only just above freezing, but it did not feel that cold due to all of the sunshine and no wind. 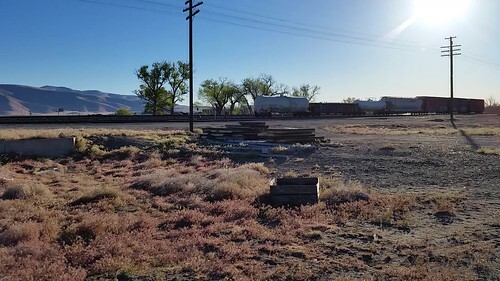 According to the Amtrak web site, my train is now just passing the US-95 grade crossing south of I-80, so it's about time for me to shut down and finish packing so Lisa can take me to Reno.